With the 2018 season over and the winners crowned, it is time to take a moment to recognize the top European performers in the Men’s Division this season. While the talent of the Division reaches far beyond short lists, these awards are meant to honor those players who put together what we believe to be the best seasons in the Men’s game this year. Holger Beuttenmüller was spectacular this season for Bad Skid. In the biggest moments, he was the go-to playmaker for his team and drove them to new highs. Many people will be surprised to see Holger take this award over Clapham’s Justin Foord, long considered the best player in Europe. 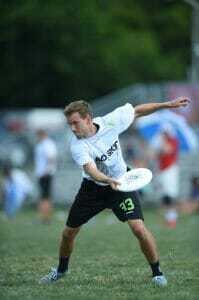 However, those that watched him play at WUCC this year won’t be surprised at all. Bad Skid started off their tournament with a big win against the Japanese team Nomadic Tribe, something CUSB failed to accomplish. Holger had a ridiculous eight assists and three goals in that 15-13 victory. The biggest game of their season was definitely their showdown against Clapham, a rematch of their loss in the 2017 EUCF final. Once again, London looked like they were going to send the Germans packing, up 9-5 at half. With their backs against the wall, Holger and Nico Muller played nearly every point, sending Bad Skid on an 8-2 run to take a two goal lead, 13-11. Clapham fought back but Bad Skid came away with a historic double game point victory and a place in the quarterfinal. With most teams choosing to force Beuttenmüller underneath, he adapted his game to become a top threat with the disc in his hand. He ran some great endzone offense and made the big throw when needed. His WUCC stats showed what a balanced player he is: 25 assists and 23 goals, averaging six points a game. That was second best in the entire Division behind Reph Jonkers (Freezzz Beezzz), who played against much weaker opponents. At EUCF, Beuttenmüller again played fantastic but couldn’t get past a strong CUSB side in the semifinal. Bologna’s depth shone through as the nabbed the double game point win. Due to the birth of his second child, Holger was a no show for Windmill and Bad Skid struggled without him. Maybe someday we’ll see seven Beuttenmüllers take to the line with family dynasty looking strong. Had this award existed in the past decade, Justin Foord would have probably won it every year. He is the poster boy of European ultimate. Many people would have given him the nod over Holger this year, and it’s not unreasonable to argue that. Foord played out of his mind in the EUCF final, leading his team to yet another European title. His partnership with Tom Abrams and Clapham rookie James Mead was too much for the young Italian team to handle. Foord sets the standard for what a world class player should be and has gained a lot of respect on the other side of the Atlantic as well. The main reason why Foord isn’t POTY this year is a disappointing performance for Clapham at WUCC. There’s no doubt they had been building towards that competition, aiming to beat their initial seeding of fifth, but they failed to even make the quarterfinals. Tchac, Bad Skid, and CUSB all had a better tournament than Clapham, which surprised us all. Unsurprisingly, Foord was still the best player on the team with 19 assists and 11 goals. And perhaps it’s a little harder for him to stand out playing on a much deeper roster than Beuttenmüller. Holger may have won the big duel when it mattered most, but it will take another massive effort to keep Foord off his throne next year. Simone was reliable all season long. He was monumental for the Italian U24 side in Perth, Australia, in January. He was the O-line captain and did his best to give the Americans a run for their money in the final but settled for a well-earned silver medal. Throughout the year, players from outside Italy joined the CUSB La Fotta side, but no matter who joined, Gasperini kept his spot on the O-line and it was obvious why. 16 assists and 13 goals made him the overall stat leader for CUSB at WUCC, just beating out Canadian Tim Tsang. Unlike most of his teammates, he played well against Nomadic Tribe, but it wasn’t enough to see them through to the quarterfinals after some good performances in the group stages. EUCF saw him pick up another silver medal with another strong performance. Expect the youngster to wreak havoc at U24 Worlds next year in Germany. Nico has been growing as a player year after year. He’s had some standout seasons in the past with several German national teams. He also gained some experience in the United States last year playing in Boston with the University of Massachusetts and Boston Ironside. All of this has slowly carved Müller into an offensive machine. 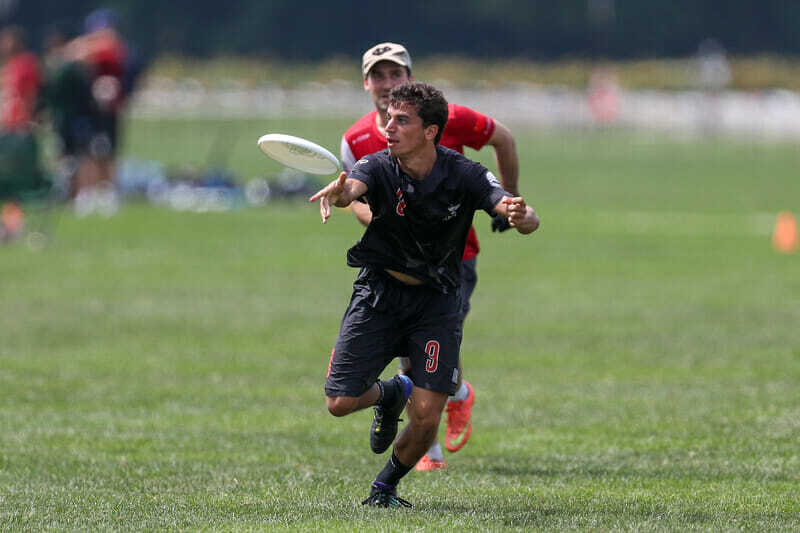 He touched the disc more than anyone else this season for Bad Skid and knew what to do with it. His 26 assist and 10 goal statline showcases his throwing prowess, but the real story is his possession-keeping play. Time and time again, he got free up the line for an easy reset. It was pivotal in Bad Skid’s signature win against Clapham. He’s the kind of player that would bring discipline and poise to any O-line. Who is Will Rowledge? And what planet does he come from? These are types of questions you may be asking yourself after watching Clapham play. Rowledge makes plays that are out of this world because he’s much more athletic than the majority of players in the Division. After leaving the Fire of London ship before its inevitable sinking, he found himself on the pedestal he belongs on. 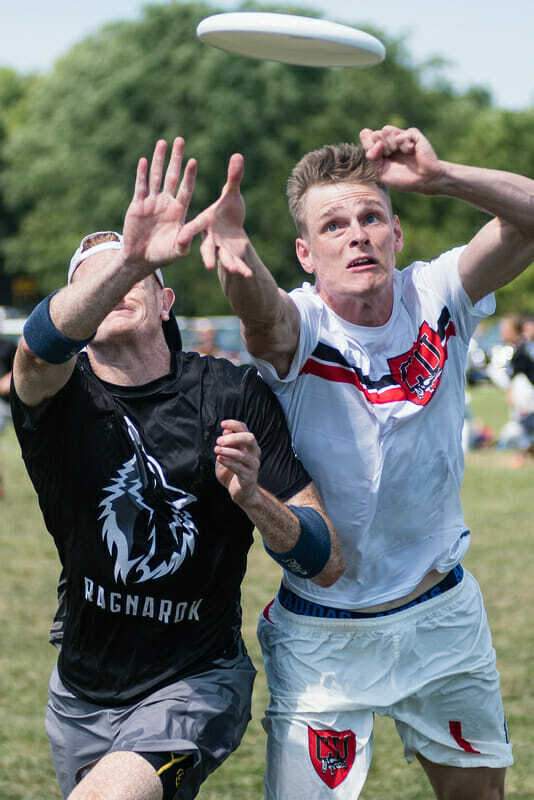 Chasing around the best players in Europe like a man possessed, Rowledge was the stat leader for the Clapham D-line at WUCC and that’s not including blocks. In the EUCF final, he made three monster plays in the first half and scored one of the game’s few breaks. Rowledge is in the perfect position to improve as a player alongside defensive maestros Andrew Hillman and James Freeman, both of whom also played great in 2018. CUSB’s Luca Tognetti. Photo: Maruša Lešnik. Luca Tognetti was a leader on the Italian team that came 2nd at the U24 world championships in January. He played on the D-line, usually starting off the point with a big spin pull. He was one of the main reasons the Italians took half in the Men’s final. He went on to play an exceptional season with Bologna, playing some great defense on Justin Foord in the Windmill final. 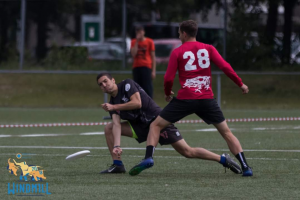 Unfortunately, Tognetti broke his nose on day two of WUCC in a game where his nose wasn’t the only thing to get crushed, as CUSB ran away 15-10 winners against Clapham. Tognetti continued to play on wearing a Hannibal Lecter costume to protect his face, but he never really looked 100%. He had a game worth forgetting against Nomadic Tribe, coughing up two break opportunities in the first point. But then he turned up at EUCF, looking sharper than ever playing on the O-line for the majority of the tournament. CUSB went to double game point against Bad Skid in the semis and started out the point on offense. After a bad drop on a would-be game winner by Hjermitslev, it was up to Tognetti to get the game saving block on Holger Beuttenmüller. They went on to win the game and put up a good performance against Clapham in the final. Rephael Jonkers was a one-man highlight reel in 2018. 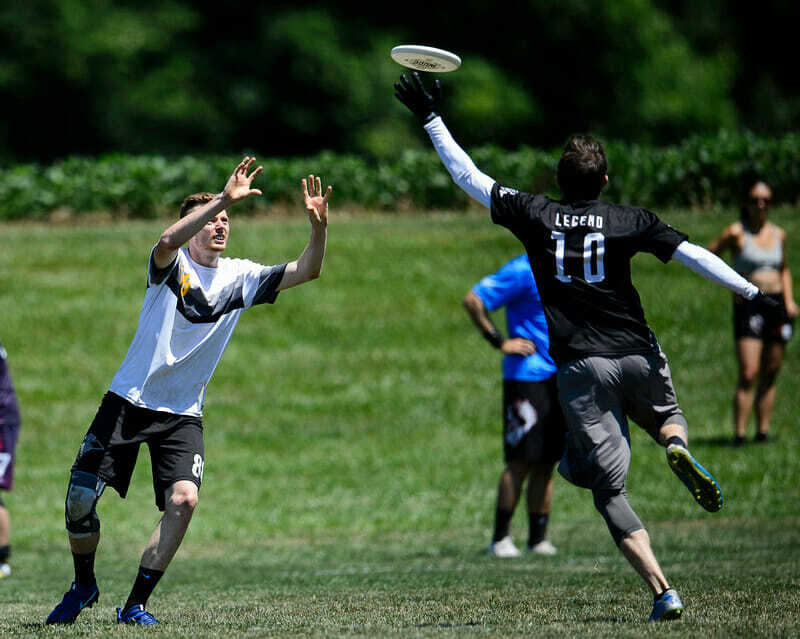 After Mooncatchers initially failed to qualify for WUCC, Jonkers joined Freezzz Beezzz for the first part of the season. Things couldn’t have started better for them with a hometown win on double game point at Tom’s Tourney, with Reph catching the winning goal. 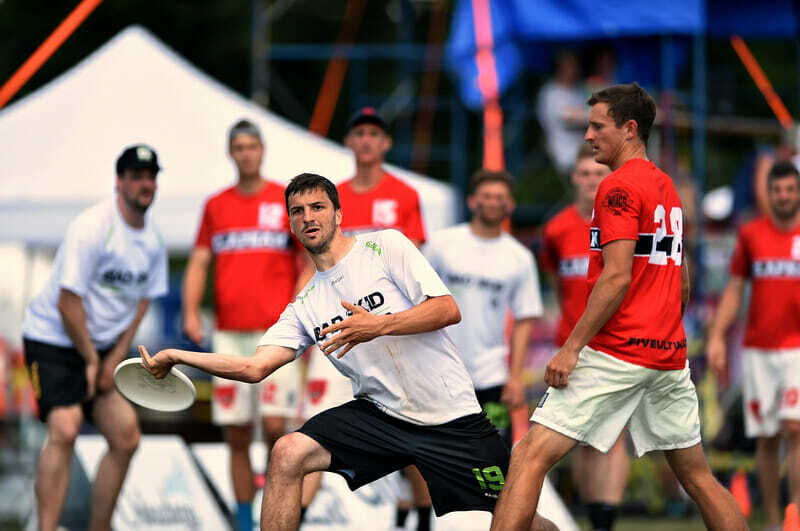 For the past few years, Pieterjan ‘PJ’ De Meulenaere has been the star of Belgian ultimate. Unfortunately, he suffered an early season injury involving a bowling ball and he never looked 100%. Jonkers didn’t hesitate to step up to the plate. He scored 38 goals and assisted 27, good for a 65 total and 6.5 points per game, the best numbers at the tournament. He finished off the season in style with a bronze medal with his actual club team at EUCF. He looked fantastic alongside his younger brother, Benjamin “Bonkers” Jonkers, who also had a breakout year. The Jonkers brothers have added themselves to the long list of siblings to be feared in European ultimate. If you haven’t heard many any ultimate commentator butcher this young man’s name, then you haven’t been watching enough ultimate this season. He is electric. There was a lot of hype around Arvids Orlovskis going into Windmill this year and he deserved every bit of it. He can sky and out-throw just about everyone. Salaspils mixed destroyed everyone on route to the final and Orlovskis was key. They failed to keep it together in the final, but he went on and won the pull competition during half time just for good measure. Controversially, he picked up with the U20 Belgian Men’s team at World Juniors in Canada, where they made an unexpected run to the semifinal. Although they lost to the USA 15-13, Orlovskis owned the skies. He roofed so many Americans that he got a work visa for general contractor work. Only Nicholas Whitlock and Lola Dam had more stats at the end of the tournament. His 26 goals and 23 assists really lifted the Belgian squad to new heights. Salaspils turned up in the Men’s Division of EUCF just after winning Russian Nationals for the first time. They fought their way through the pool of death to come out on top with wins over Freespeed, M.U.C and FUJ. Finishing 6th overall, the Latvians had a whopper of a season and Orlovskis was vital every step of the way. Comments on "2018 European Men’s Club Awards"